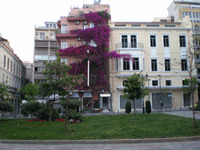 The Metropolis is a small intimate hotel in Athens with an Acropolis view in the prime central location of the Plaka district and 2 blocks off Syntagma Square. The Metropolis provides all amenities and comforts that a traveler has come to expect. Warm hospitality and attentive service will help make your business or leisure stay in our hotel in Athens extremely pleasant. If you are familiar with METROPOLIS HOTEL, please share your opinion of it with other travelers. Write a review!